It's the father-son bond that's inspiring the world. 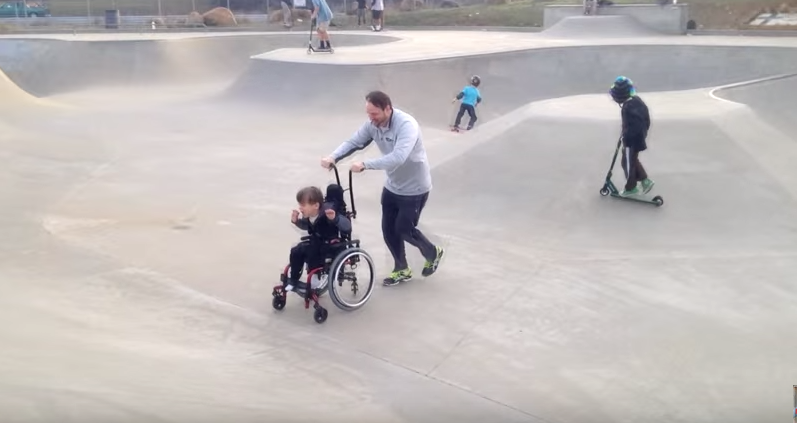 A video of a boy with cerebral palsy zooming around a Sacramento skate park with his dad's help is going viral. The look in 8-year-old Atticus Edmunds' eyes and the huge grin on his face make it clear how much he loves action. "That was great!" he exclaimed after his dad pushed his wheelchair up and down the ramps. "That was fantastic! That was crazy!" The video quickly generated tens of thousands of views in a matter of days. And it's not just inspiring -- it's also bringing awareness to why Atticus can't walk alone. "It's so exciting for me, because as his mom -- as his advocate -- my goal is to make room in the world for him and to get people to see him as a kid first and the chair second," Tresa Edmunds told CBS Sacramento. She blogs about their family life, creativity, and health issues at ReeseDixon.com. Atticus also loves to sing, and he's racked up his share of social media followers singing Katy Perry songs. But with his latest viral video clip, Edmunds hopes Atticus gets more people talking about cerebral palsy. "His brain doesn't talk to his muscles the same way," she said. "So he just has to find creative ways to get those messages out." The neurological disorder limits muscle strength and coordination. Edmunds says she has since gotten her son a helmet and special skating gear for his future adventures "shredding" the ramps.